Check out the great style on this Judas Priest tee. 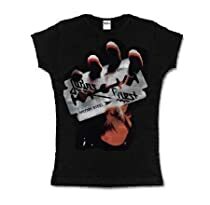 The cover art from their 1980 album 'British Steel' is printed on the front; a 3-D hand holding a razor blade printed with 'Judas Priest' and 'British Steel'. The shirt design is lightly distressed to look and feel authentically vintage. The huge graphic looks awesome against the black background. British Steel is one of Judas Priest's most popular albums, considered their best effort. Celebrate the performances of these great album tracks, including "Breaking the Law", "United", and "Living After Midnight" with this incredible shirt. It is exactly like the original. It was a hit with a die-hard J.P. fan that wore his out years ago. Thank you. Shirt came when promised, packaged right, and the right size. I looked on several websites for this shirt and everyone had it, but no one had an XL except here. This will be an awesome gift for my heavy metal son at Christmas!